Forget your beloved Big Mac 'cos there's a new burger in town, and it's taking us back to those good old days of making like Ed Sheeran and building Lego houses. Brick burgers have just made their way straight to the top of our bucket list snack list, and proved it really is hip to be sqaure! It appears Lego is doing a Selena Gomez and having a bit of a revival moment right now. Not only does it now own the crown as the greatest beauty hack since coconut oil, for it's effectiveness at washing our makeup brushes, but you can now er, eat it too. But health freaks relax, because this Lego snack doesn't come with a choking hazard, it comes in fact, in burger form and looks totally drool worthy. 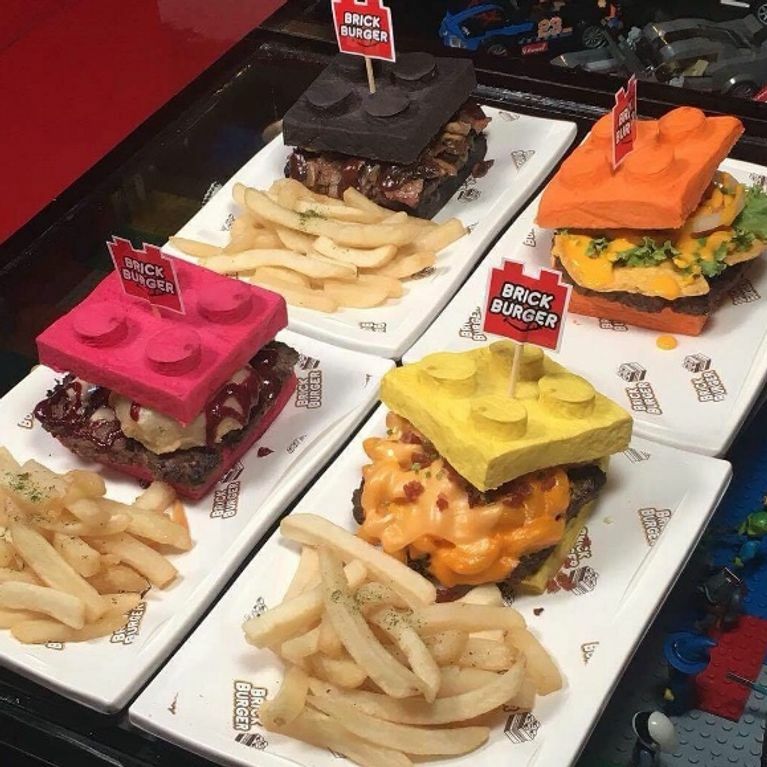 Brick Burger, a fast food restaurant based in the Philippines, offers an array of Lego-themed burgers for hungry food fans ready to fill their bellies with nostalgic goodness. Because who doesn't yearn for the simple days of eating too many BN's watching Hey Arnold, right? The aptly named 'Brick Burger' is switching up the fast food game by serving up square patties in colourful square buns and they're giving us life. We always knew it was hip to be square. Jergs Correa, who owns Brick Burger, had the vision of creating a restaurant which caters specifically for Lego fans, and the guy has only gone and followed his dreams to do exactly that. But the madness doesn't stop at Lego burgers, there are also 10 different types of patty on the menu. So whether your burger taste is pretty missionary and you're partial to a classic cheeseburger, or if you're really hungover and fancy a macaroni and cheese topped burger with bacon bits, Brick Burger has it all. Anyone fancy pitching in for my plane ticket to the Philippines?